After reading that article, one of my blog’s regular readers Rashmika sent me one script to do the same task. Herewith, I am giving the script by given Rashmika. 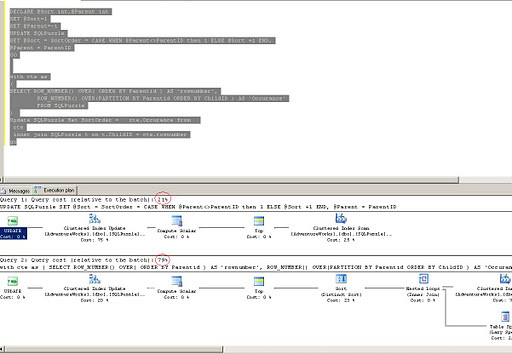 I have used simple UPDATE statement and she has used new feature introduced from SQL Server 2005 CTE. I always like to publish comment, concern, query or solutions given by my readers. Note: If you have not read my previous article on this topic than kindly read it to understand more. This solution works perfectly fine. After running above query I thought to see performance difference between two script and here is the difference, my first solution is much faster but the script of Rashmika is really good example of CTE. Suppose we have one table with ID, ParentID and SortOrder and we want to stimulate sort order based on ParentID. How do we do that without looping and cursor? 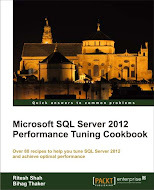 There may be quite a few ways to do so but I would like to go for simple T-SQL.